How to Record Your Desktop with Filmora Scrn? The best desktop recorder for you to capture and edit videos with powerful features. Desktop recording or recording the screen activity on the PC can be fun and sometimes it gives guidance to many people. All sorts of videos are shaped with the help of a desktop recorder. If you are just starting off to learn those video skills, it can be a difficult task for you. Considering this fact, we have brought this post that contains a simple guide on how to record desktop easily and quickly via an ideal desktop capturing tool. Scroll down a little to get the name of that tool revealed. Initially, Download it and install it. After completing all installation formalities, launch Filmora Scrn on your computer. Now, the main interface will provide you three options which are "Get Started", "Quick Capture" and "Video Editor". Get Started – If you wish to hit on this tab, you will be brought up to a new interface where you can customize the recording parameters according to your preferences. For instance, customizing audio settings or adjusting the recording area, frame rate, or also to set recording source as webcam (if you need) along with recording your desktop screen. Quick Capture – If you prefer to record your desktop with the default settings, you should then hit on this tab to immediately launch the capturing console. Video Editor – This tab is specifically for the video lovers who wish to edit and enhance their videos by adding annotation effects, cursor effects or by doing some basic video editing (crop, split, resize, rotate and more). Hit the one that suits you, in this case, hit on "Get Started". Right after pushing the "Get Started" tab, the "Setup" interface will load up. You will now have 4 different categories to customize the Record Settings. 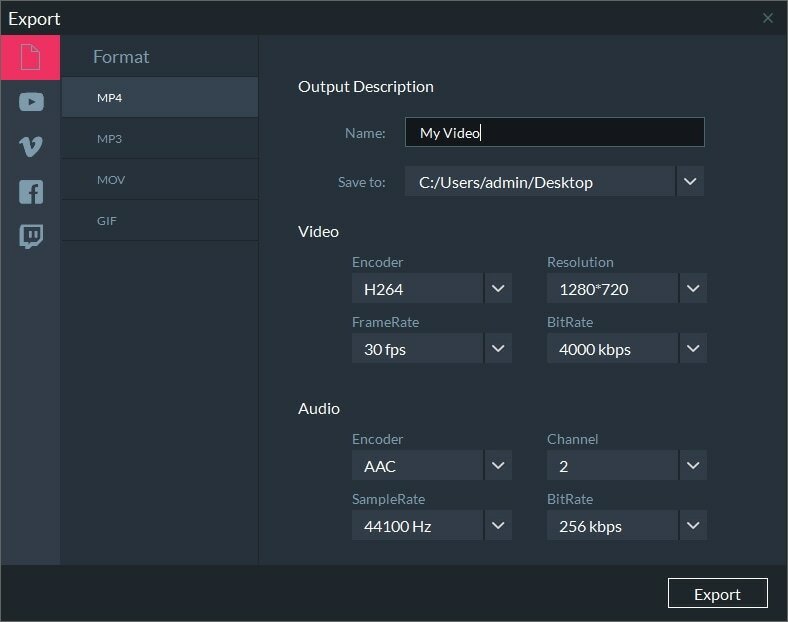 Screen – Customize capturing area on your desktop (full screen, target window or a specific region), set the preferred frame rate (up to 120 FPS) for your video. Or select, "Game" if you wish to record gameplay. Audio – Under this section, specify the preferred audio source for your video, either from Computer or Microphone or both. By default, it is set on both. Camera – If you have a webcam installed, you can record video via your webcam along with capturing your screen. Get into this section and select your camera, preferred resolution and frame rate. 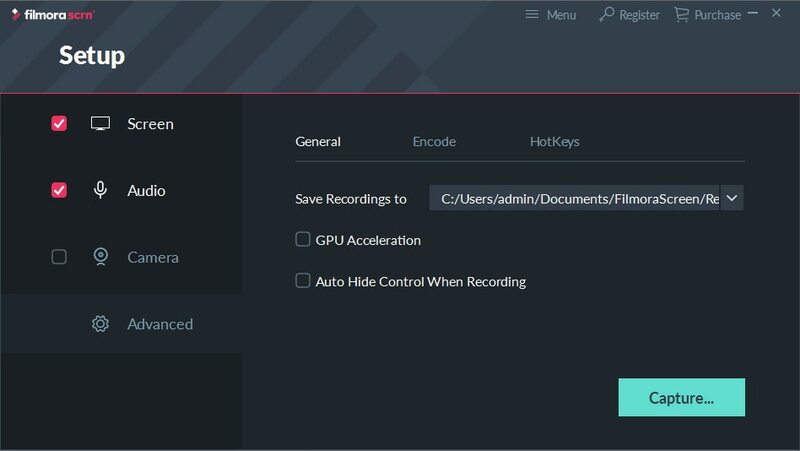 Advanced – Here in this section, you can set the path for your recorded video, enable or disable GPU acceleration and setup hot keys for your convenience. Once finished with customization, hit on "Capture" to launch the recording console. Now, the recording console will pop up on your screen and you are just a click away to record your desktop. Hit on the big "Record" button at the top of the console or hit "F10" on your keyboard. A countdown will begin and right after that your recording starts. If you wish to pause the video, hit "F9" on your keyboard and similarly, hit the same "F9" to resume the recording again. Or, if you wish to stop the video, just have to hit on "F10" key on your keyboard. Finally, in this last step your video will be loaded in the built-in video editor for the final touch up to enhance your video before it is exported to your local storage. You can add annotation effects, cursor effects to your video. Or, do some video editing like crop, split, resize, rotate and more. When you’re done, export the final file to your local storage and enjoy. Here is what we were talking about a moment ago – Filmora Scrn. This is remarkable desktop capturing software that is designed to work with both Windows and Mac computers. Along with being a high-quality desktop recorder, Filmora Scrn makes sure to elevate the captured video quality by offering numerous powerful editing features. Its modern and intuitive design helps the users to effortlessly record their desktop screen ultimately removing their concern of how to record desktop without any barrier or hitch. Filmora Scrn is a risk-free and quick tool to record the desktop which makes the users to make their projects faster making it a good option for the people who are in hurry and want no inconvenience while recording. This screen recorder comes with the ability to record 15-120 FPS. This desktop recorder also allows users to import over 50 file formats. You can record Webcam as well as screen at the same time via this software. You can also export your file to multiple formats with Filmora Scrn. This was all about how to record desktop using an exceptionally easy desktop recorder. We have given you the best way through which you can record your desktop with no trouble. And more than that, Filmora Scrn is not just desktop capture software, but offers many video enhancing tools and a wide range of possibility to give the recorded video a little more finishing. We hope you found what you want and got the results you expected with this software. Your given time is really appreciated and many thanks to read this post. It will be a content feeling if you could share your experience or feedback with us by dropping a comment below. Great. But CANNOT find instructions on how to scrn capture AND show the webcam. I can get it to record the webcam image, though I cannot see it for placement, until AFTER completion, then there it is! In the upper right. But no instructions on how to drag it around and size on a Windows 7 PC. No handles or anything show.